Transform your property while you increase its value — with a finely crafted landscape by Martin’s! Martin’s Landscape Services has been crafting the finest outdoor spaces in the Twin Tiers of New York and Pennsylvania for over 30 years. Designing, installing and maintaining fine landscapes is what we do. Year after year our design and installation team seeks to exceed each and every client’s expectations by transforming their property into a functional work of art, able to be enjoyed in every season — specially suited to their tastes — perfectly integrated into the rest of their property. From the beginning we chose to built our reputation on our uncompromising commitment to do things right. Our goal is to develop a long-term relationship with you as a client and serve your needs both now and in the future. A beautiful and functional landscape never happens by accident — they come about by a well-thought-out design. We’ll bring your property to life by meeting with you, discovering your vision, and developing an innovative landscape design that enhances the beauty and value of your property, while expressing your individuality and good taste. We will work with your home’s surroundings, character and features to make your property more functional and enjoyable. 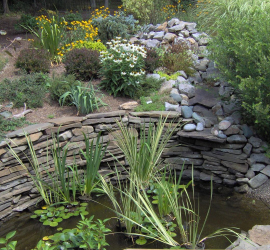 Our landscape designers will enhance your property by integrating the natural beauty of hardy, Northern-grown plants with various hardscape materials (such as: field stone, pavers, wall systems, water features, outdoor illumination, decks and other structures) to create outdoor spaces that you can enjoy for a lifetime. We build landscapes that last! Our trademark has become crafting inspiring, innovative;landscapes and hardscapes that last. The proof is in the hundreds of area landscapes that we have designed and built. We consider each of our landscapes to be an enduring testament to our innovation and high standard of excellence.